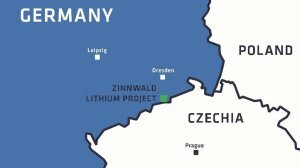 London-traded Bacanora Lithium has been granted an additional exploration licence in the Erzgebirge region of Saxony, which has the potential to significantly increase the life-of-mine at its Zinnwald project. Bacanora’s 50%-owned subsidiary, Deutsche Lithium, has been granted an additional 42 km² licence, which forms part of the same geological unit that hosts the historic lithium/tin/tungsten deposits at Zinnwald and Falkenhain. The deposits on the Altenberg licence have been explored and mined historically and Bacanora said on Wednesday that Deutsche Lithium would combine the exploration and development of the new licence with Zinnwald and Falkenhain. The company said the deposits on the new licence had the potential to increase the resource base already delineated at Zinnwald, which currently comprises 142 240 t of contained lithium. "Hosting deposits that have historically produced lithium and lying on the same geological play as other mines in the area, the Altenberg licence is an excellent addition to our existing Zinnwald lithium project,” said CEO Peter Secker. Located in the heart of the European battery and automotive sectors, Zinnwald is strategically positioned to become a leading supplier of high value lithium products to the rapidly emerging European electric vehicle sector. Bacanora is advancing a feasibility study focusing on producing higher value downstream lithium products from the Zinnwald concentrates for the battery and automotive sectors. The study will be completed in the second quarter. Bacanora is in discussions with financial advisers and potential strategic partners to spin off and separately list Deutsche Lithium.